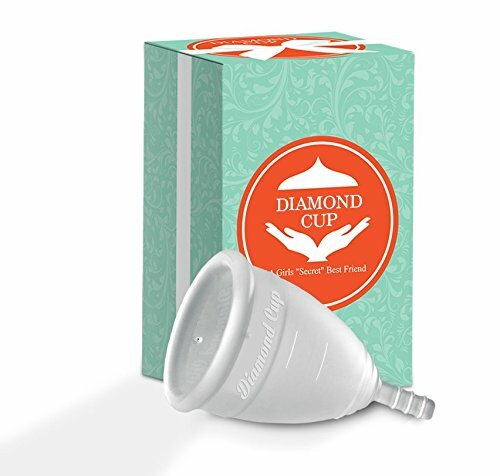 In addition to buying a menstrual cup for yourself, when you buy a diamond cup, you will be supporting women’s issues through femme international and Somebody’s Mama. Their causes are for educating, supporting, and training girls in feminine hygiene and other women’s issues. The cup is made of hypo-allergenic silicone. It has a bell shape with airholes around the rim. There are gradation lines to help you measure your monthly flow. The stem and bottom of the cup have gentle ridges to help with grip during removal. The branding is engraved on the cup. This cup will be neither harder nor easier than other menstrual cups to insert. This cup does not have any specific features that would facilitate removal. This cup comes in two sizes. The smaller size (A) is made for women who have not given birth or who have had a Cesearean. The larger size (B) is made for women post-childbirth. Note that these guidelines are different than other menstrual cups, which generally advise women to select the larger size when they're over 30, regardless of whether they've given birth. If the cup doesn't stay in place or leaks, you may need the larger size. The cup is designed to be as soft and flexible as possible. Due to the brand engraving, this cup may be harder to clean than others. This cup is in the mid-range for menstrual cups. This menstrual cup is made in the United States, but is not registered with the FDA.